Gigi Hadid Channels Barbie Girl For Vogue Eyewear Launch! | Alexandra Richards, Andreja Pejic, Gigi Hadid, Jordan Barrett, Skai Jackson | Just Jared Jr.
Gigi Hadid Channels Barbie Girl For Vogue Eyewear Launch! Gigi Hadid strikes a pose in a pink biker jacket and pink high-rise pants as she attends her Gigi Hadid For Vogue Eyewear #ShowYourParty Launch Party held at the Industria Superstudio on Tuesday (June 27) in New York City. “Gigi’s amazing personality and fresh attitude perfectly match the #SHOWYOURVOGUE vision, and that’s why Vogue Eyewear chose her to embody its values and push the campaign to the next level,” Greta Gervasini, Vogue Eyewear Global Marketing Manager, said in a statement. 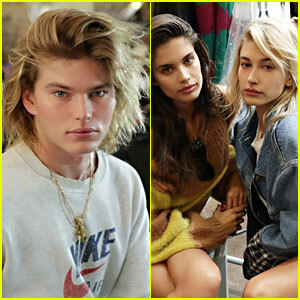 Also in attendance at the bash was Jordan Barrett, Skai Jackson, Andreja Pejic and Alexandra Richards, who served as DJ for the event. FYI: Gigi is wearing a Kreist leather ensemble with Aquazzura platform heels. Gigi Hadid Has a Family Night at Harper's Bazaar Icons Party! Bella Hadid Met Her Supermodel Twin at Cannes! Kendall Jenner & Jordan Barrett Hit the Pool in Cannes - See Pics! Kendall Jenner Has a Girls' Night Out with Her BFFs! Selena Gomez Stuns in Sheer at #BoF500 Gala in NYC!